Used this for a small office installation. The box we received was in perfect condition. The markings on the cable were helpful for gauging how many feet were left. I was worried about the flexibility of the cable but it worked well running through to the wall jacks. Great Cat6 cable for gigabit with PoE. A bit pricy but worth the money in order to avoid hassle. Used this for several long inside building runs. Replaced some other Cat6 runs that were failing cable test and having sync issues when using PoE. This one passes the test every time and no PoE issues. Work like a champion to issues..
Great price and great cables! Great Cat6 cable for those long distant connections. This cable pulls well as it has built in support on the inside of the cable. I've never had any problems installing this cable. this is so thick that you have a tough time using standard connectors. We used this at our new offices and considering the price it was a great quality cable. No tangling like some other wires we have purchased. Solid copper cat6 easy to work with no issues other than user error connecting the plugs. Works well and decently priced. I have use this on multiple jobs and never had a problem with it. I use Cat6 a lot as a Network Admin. I will be purchasing this again. Great product. I run a business online and have to maintain my Internet connection and speed. This cable is the perfect tool for me to keep my Internet running in optimum condition so I can complete my orders on time. I have used some of the cheaper cables in the past and often ended up having to replace them a few months later. This product is very different and I can tell that though it is somewhat pricey it was money well spent as I expect this cable to last me a few years. Not being the most tech savvy person myself I was relieved that this had a very simple set up. Very pleased with this purchase. It's Cat6 cable. Nothing special. Not too much to say other than we haven't had any quality problems. Cable has worked well. Awesome product. Pulls nice strips easy and havent had any problems pulling from box. Ive used this product numerous times. I bought 2 boxes of this Cat6 cable 2000ft and ran probably 75% of it. I never had a problem with any of the cable. It's heavy duty and well made. All of the connections that I made are working perfectly. The box it comes in is also convenient and it pulls easily. Nice heavy duty Cat 6 solid copper cable. Good for making small length cords or running wires in walls. For the price this has exceeded my expectations. Traditionally solid ethernet cables are difficult to crimp since the solid wires are harder to manipulate than twisted pairs. I managed to crimp this cable with no problems. I've also used this cable to carry and HDMI signal over 90 feet. Again no issues my HDMI signal is reconverted and is crystal clear 1080 at the end. I would highly recommend this product. Reasonable price and it works. This cable is actually the best I've seen yet after making hundreds of patch cable using different brands. It comes with a very thick jacket and the solid copper wire comes with a pretty dense jacket itself. I ran it in the walls but judging by the jacket it seems it will do well in all weather. The cable flowed out the box very smoothly and showed great connectivity after terminating each end. I will use this again in the future. I suggest it to anyone looking for a quality wire for a quality job. This is the first time I've used cat6 compared with cat5. It has a nifty little plastic spacey thing in the wire which keeps the four pairs apart and seems to make the wire a little more crush resistant. Apart from that it's wire made to a precise international standard in a real nice reel box for a reasonable price. Can also be used for hanging clothes. I was wiring my living with Cat 6 cable and this seemed like the ideal solution for the 8 runs I needed to make. The cable was easy to cut and work with and I had no problem attaching the ends to the cable. They have worked flawlessly so far. This product is as described in the description. Great quality had no issues with this product. Will be using it little by little to use it all. Easy to work with easy to pull. I have read other reviews about the box being subpar and/or the cable binding up in the box but I have not found this to be an issue. The OD is a tad larger than cat 5e so it is a bit snug in the RJ45 connector but I actually think this makes it more sturdy. 4.800What more can you ask for? Did a wiring job on the house. So far I've only made about 6 cables and only one was a fail but because I screwed up crimping the connector. Once I put a new connector on everything worked fine. Awesome cable registers at gigabit speeds. What more can you ask for? What can I say this wire is good old Cat6! Works great for running in walls and ceilings as it is less prone to snags and tears. I would definitely buy again! im not exactly sure how to rate the cable we use this cable for a long 50 foot run in a church from computer to projector and its work as design and computer it great. However we do go thru a couple of kramer converters to switch analog to hdmi signals. Good Price and a nice little feature is that on the wire it tells you how much of the wire you have used so you know how much you have left. Very kewl. Not much to say I've not done any speed tests but the network is nice and fast the cable was easy to work with. I would buy again. Good quality cable made well I like the way it handles termination and pulling out of the box. I highly recommend for longer distances. I purchased this cable to use for remote purposes. I needed cable that was strong and wouldn't break from being bundled up multiple times. I haven't had this cable long but I believe it will work out great for my needs. The cable is very solid and I haven't had any problems with any of the cables that I have created so far. I highly recommend this for anyone that needs cable for remote runs! high quality cable with plastic core separator in the middle. Work great in my home for all my device peo cameras and others pc and nas. Excellent product and very good price for CAT6 cable!! !The box of 1000 feet of cable arrived ahead of schedule and in good condition well packaged. Excellent CAT 6.. I have used several different brands and install this stuff a lot. 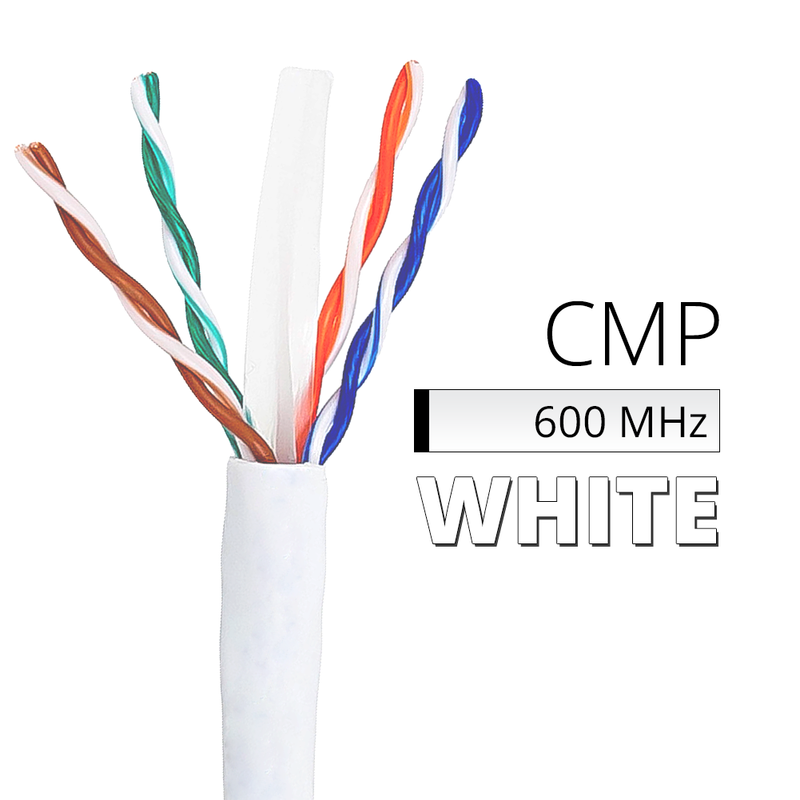 This is by far the best shielded most flexible and easiest CAT 6 you will find. Well Worth the price! this is a good quality cable but make sure you need to use CAT 6 Connector. It doesn't work with CAT 5e connector and Strain relief. Great price product packaging and shipped super fast! Cable is of great quality and easy to pull out of box. Highly recommended. Purchased this cable to set up gigabit ethernet network in a new office. Cable shipped fast and when it arrived I was pleased with the quality. Would recomend this cable for anyone in a similar situation. 4.700Exactly what it was supposed to be. It's hard to write a review about something so basic. I mean it just works. I had no problems with receipt or wiring. It was exactly as advertised and I've noticed no issues what so ever. This is extremely good wire. Very well made and performs flawlessly. Cannot beat it for the price. I will be pulling my whole house with it and would recommend it to anybody. Including fellow tradesmen. Received the package very quickly after my order and was exactly as expected. The price was reasonable and it's been meeting my needs ever since. I recently ordered 1000 ft of Cat 6 cable. It came within 3 days and was exactly as pictured. The price was also much better than at any box store. Never buy cable there. The cable was easy to work with and was sturdy enough to work through some tight spaces in walls.